Deborah E. Lubetkin, Psy.D. is a Licensed Psychologist in Montclair, NJ. She is also a Kripalu Yoga teacher (RYT-200), and a Certified LifeForce Yoga® Practitioner and mentor. Deborah's work integrates psychotherapy with LifeForce Yoga and Eastern Philosophy. Last month I traveled to Ofakim, Israel, a small town in the South of Israel just 28 kilometers from Gaza. I joined a Greater Metrowest Federation P2G (Partnership 2Gether) program called Yoga Connections that a dear friend of mine, Leslie Gurland started 4 years ago in Essex County, New Jersey. On the trip, I volunteered to provide LifeForce Yoga to a variety of people and programs throughout this community. Our journey began only 3 months after the July-August airstrikes on Israel. Ofakim, meaning "horizons" is a community in the Negev in southern Israel that has been hard-hit by missile attacks since its formation as a development town in 1955. Close to the Gaza border, Ofakim was built to receive the large number of immigrants arriving from North Africa, and later, the Soviet Union. I felt strongly that bringing LifeForce Yoga to this community would help to provide a resource to aid in both coping with and healing from the emotional-psychological impact of living under the threat of missile attacks after the end of Operation Protective Edge just 3 months prior to this mission. While there isn't formal research on the incidence of Post-Traumatic Stress Disorder (PTSD) in Ofakim, there was a significant amount of self-reported trauma in both the children and adults in this community. As one woman from Kibbutz Erez, just one mile from Gaza told us, "I feel like someone should wake me up from a bad dream. I emptied my closets so if someone comes, I hide my daughters. Months later I realize I have post-trauma." The way that LifeForce Yoga was received by the people of Ofakim was both remarkable and inspiring, and I would like to share some of these experiences in this article. (Note that there are other settings where the group provided yoga where I did not teach: senior centers, ultra Orthodox women's groups, special needs adults, and at-risk teens in a group home). From my beginning preparation for this trip, I had a strong sense that there was really no way to prepare a class or have a plan. One of the things I love most about LifeForce Yoga is how deeply the practice allows me to access my intuition, whether practicing on my own at home, or teaching a class. I had no idea at all who and what would face me each day, and I relied on Amy Weintraub's wisdom of "meeting the mood on the mat." I was also dealing with a language barrier, and I had translators with me in most classes. All the populations I worked with received and appreciated the mantra sounds, which are part of the Lifeforce Yoga protocol. There was neither conflict nor question about the sounds being something religious. Of course, I also explained, as Amy explains, that the sounds are universal tones, often vowel sounds found in every language, often ending with the soothing sound of "mmm." When I used longer mantras, the translators explained their meaning. For example, that ShaMaYa is a mantra of peace for the heart. In several groups, we used the Hebrew word Sh'ma instead of the Sanskrit, ShaMaYa and this really helped to create a safe container by offering the students full permission to find sounds in their own language that resonated with them. One group of girls also offered the Hebrew word, Shamayim which means "sky" or "heaven." This was one of many moments where I welled up with tears of connection and awe, as we raised our arms into a full Sunbreath, gazing toward the sky. I invited the girls to choose any of the 3 mantra options that felt right for them. As we inhaled with a sunbreath and dove down into a forward bend using one of the 3 options, it was, as Amy suggests, "a symphony of sounds." Sounds are clearly a universal language. By using the mantras, I didn't need as much translated into English and this profoundly impacted the depth of the classes. In my classes in the elementary schools, the sounds helped the children stay focused, and it was a way to work on clearing blocks in the energy centers without having to explain anything at all. Since the events over the summer, when sirens were going off daily, and people had to run to their safe rooms or bomb shelters, the stress level increased dramatically. As reported by a teacher on Kibbutz Erez near the Gaza border, many of the children were showing symptoms of PTSD and Acute Stress. She explained to us, "they fear going to the bathroom alone and having the door locked. I made a special signs saying STOP or GO so the children don't have to lock the door." Kids were sleeping in their parent's beds, were over- or under-eating and having nightmares. I noticed as I taught in the schools that even turning one light off in the room was triggering to some of the kids. I had to keep the environment stable and not startle them. During one class, I was thinking about how to use the RAM sound, but in my head it kept sounding like sirens, so I just stayed with the gentler "Ah," the cooling, calming tone for the 3rd Chakra at the solar plexus. Even in the Orthodox day school, both the children and teachers embraced the mantra practice openly. For example, while we practiced a Warrior Two standing flow, I led them in inhaling the arms overhead, straightening the legs, and exhaling back to Warrior 2 while "singing" Lalalalalala. On the Army base, the Officer who invited us to tour and teach a class said to me, "I have no time to cry, and when I do, I can't." She asked for a vigorous physical practice to "prove" to the soldiers that "yoga is a serious exercise." I heard what she said, but also trusted intuitively that yes, I needed to give them a physical challenge, but I could do this in a way that would reach what I believed to be the higher need: that of clearing space, releasing emotional obstructions, and finding their own inner resources and sense of true self. Since they spoke English, I had more space myself, and I worked with them on understanding the dualities that always exist within each of us: the strength with the vulnerability, the joy with the anguish, the love and the loss. I integrated a lot of cueing to direct sensation throughout the class, and especially after energizing pranayama such as the Power Hara. I used the victory goddess pose with the mantra DiRiHa for personal power, having them sustain the pose for a long-hold, while at the same time finding freedom, movement, and joy in their upper body. I also offered a short Yoga Nidra during Savasana, a relaxation in a supine position. At the end of the class, the Officer came up to me and said, "I am so glad you didn't listen to me! This is what we REALLY need." These are only a few of the many inspiring experiences I had with LifeForce Yoga in the community of Ofakim. LifeForce Yoga was recognized by the staff and leaders of this program as a practice that they feel is necessary for the community to have on a regular basis. So the LifeForceYoga Nidra CDs, donated by Amy Weintraub and myself to the soldiers, along with other programs in Ofakim are a beginning, a planting of some healing seeds that will one day flourish into a viable resource. With the support of Amy Weintraub, Greater Metrowest Federation P2G and Kripalu, plans are in the works to continue training yoga teachers and LifeForce Yoga practitioners who reside in Ofakim so that the community will eventually have more of their own yoga programs. 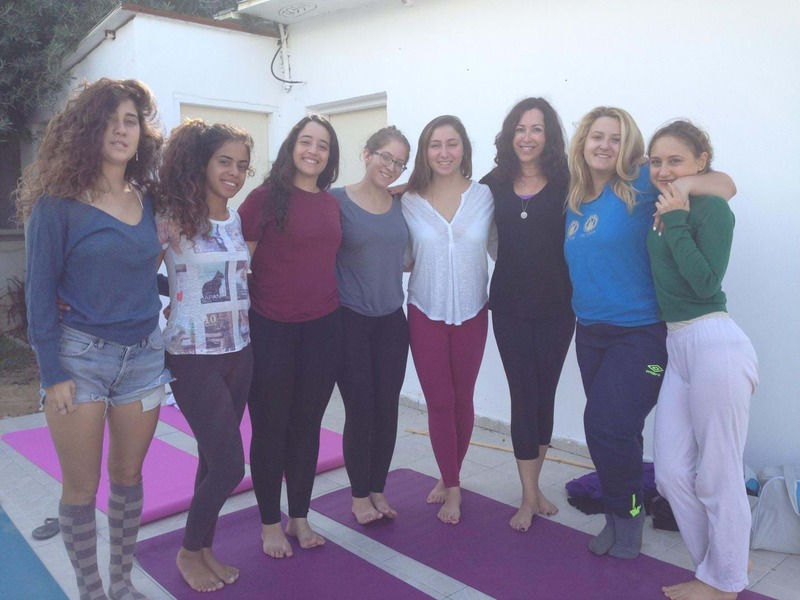 Last summer, Kripalu generously provided scholarships for two school teachers from Ofakim, giving the community of Ofakim their first two certified yoga teachers. In the meantime, I set a new personal resolve (Sankalpa), which I nourish each day in my own practice. "Infinite connection breathes through me always."